U.P. 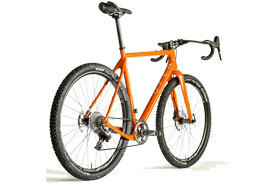 (Unbeaten Path) combines a performance-oriented road geometry & parts with clearance for mountain bike tires. Start on asphalt, hit the gravel, switch to single track. Its geometry makes you fast; its tires unstoppable. The Classic U.P. 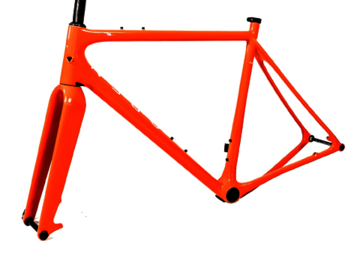 accepts post-mount brakes and ships with a 3T Luteus II fork. In the box: Frame, fork, headset, seattube collar, front & rear thru-axle, 2 derailleur hangers, 1 front derailleur mount, 3 MultiStops (2x, 1x, Di2), chainstay cable exit, BB guide, cable liners, noise-reduction foam sleeves. The U.P. 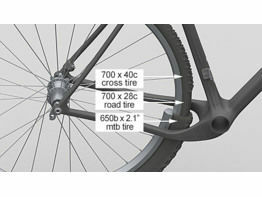 fits mountain bike tires up to 2.1" wide. 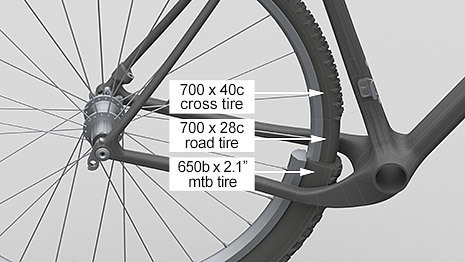 But you can also fit a 40mm cross tire, or a 28mm road tire, or anything else in-between (exact tire sizes depend on manufacturing tolerances and rim width, so this is a guideline. Always make sure you have 6mm clearance between tire and frame).